It’s been nearly two years since I discovered the magic that is Aquafaba, and I’m still amazed by it. Who could have ever thought the liquid we usually wash down the drain, from a can of chickpeas or other legumes, could turn out to be the most amazing egg white substitute? Since then, I’ve used it to make meringue nests, iced gems, royal icing, American frosting and lemon meringue cupcakes! But this recipe is for meringue kisses. 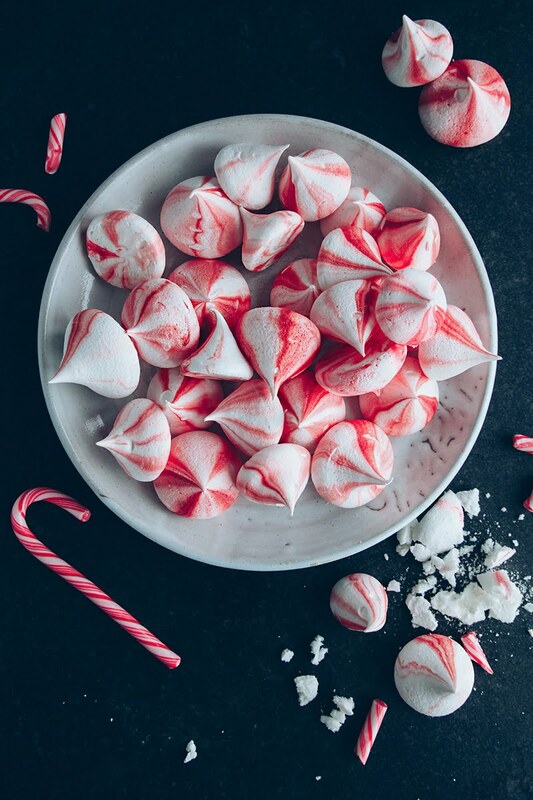 Candy-cane or peppermint flavour meringue kisses, to be precise. And not only are they adorable and festive, but they’re absolutely delicious! They’re like candy canes that melt in your mouth. 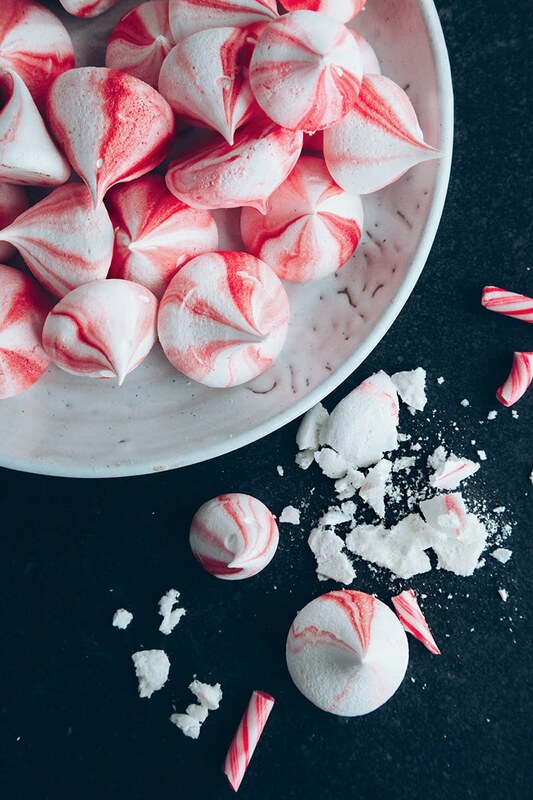 Cute and delicious little vegan meringues that taste like candy canes! Preheat oven to 100C / 210F and line three baking trays with greaseproof paper. Drain the liquid from the can of chickpeas into a large clean bowl. You can keep the chickpeas for another recipe. Just add them to a container with some clean water and keep for up to 3 days in the fridge. Using an electric or stand mixer, whisk the liquid on a high speed until it forms soft peaks. At the stage, start slowly adding the icing sugar. Keep whisking until it reaches stiff peak stage (the mixture stands upright on the whisk). Mix the vanilla and peppermint in at the last minute. 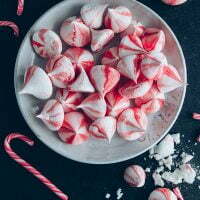 Meanwhile, open out your icing bag and carefully use the red dye and a teaspoon or a clean paint brush to paint red lines onto the inside of the icing bag. Starting from the bottom, stopping about 1/3 way from the top. Transfer the mixture to the icing bag and start piping your meringue shapes. Squeeze the meringue near the surface of the baking sheet and then pull up to peaks. Add the trays to the oven and bake for two hours. My oven tends to run a little hot so I used a wooden spoon to prop the oven door open slightly. If you have this problem too, you may need to do the same. After two hours, turn the oven off and let them remain in the oven for another hour to cool. They should be crunchy on the outside and soft and mallow-y on the inside. It's important to keep them in an air-tight tin as they will start to soften if left out too long. Total waste of ingredients, time & gas for the baking. At first, the juice whisked up picture perfect, until I added the flavoring & powdered sugar, then it all went flat. I did this on a nice cold, low humidity day. Should’ve just went with the Wilton meringue powder instead. So, exactly HOW LONG does it take to electric-whisk the meringue to ‘stiff peak stage’???????? Are all of the comments here just here for the viewing and commenting how beautiful they are (and for sure, they’re absolutely stunning in YOUR photo) ? Have any of you actually tried making them?? Any success???? I’m very frustrated. Beat the merengue fir half hour and the consistency did not change. Piped it anyway but they are flat. I’m hoping they don’t all just spread out into one flat uselessness. So disappointed. The batter tasted good. I agree with you! The batter tasted good, but all in all, it was a total waste of time and ingredients. This recipe worked perfectly for myself. I only encountered one issue which is probably comes down to my local climate. Once they were out of the oven (about an HR after cooling) they became sticky (borderline melting) again. Put them back in the oven for 10 minutes and all was fine! I can't wait to give these to my nephew! He has a serious egg allergy, so this was an awesome recipe! Horrible recipe !!!! Making them for Christmas I was beating the ingridenta for half an hour got no where but a slight thick paste so I tried it, couldn’t pipe it at all!!! Just goop on my sheet. So disappointed! Same here...it was fine until adding the vanilla and peppermint at the end. Bummer! Am I missing a recipe for the dye? Is there a product you buy? Thanks! Hello, do you think these will mail well? I would use tins from michaels to store and mail them in. Thanks for the recipe! Hi Tana. Honestly, I'm not sure they will. Depends how quickly you can get them to the sender! They tend to go soft after a couple of days, unfortunately. Good luck! Do these freeze okay? I'm wanting to try these and get a head start on holiday baking. what do you mean by “paint red lines onto the inside of the icing bag. Starting from the bottom, stopping about 1/3 way from the top.”? Kelly - use a paint brush and brush the coloring up the bag starting where the tip hits the bag (the bottom). So I took these to a holiday party tonight. I was nervous because they didn't turn out as cool as yours. 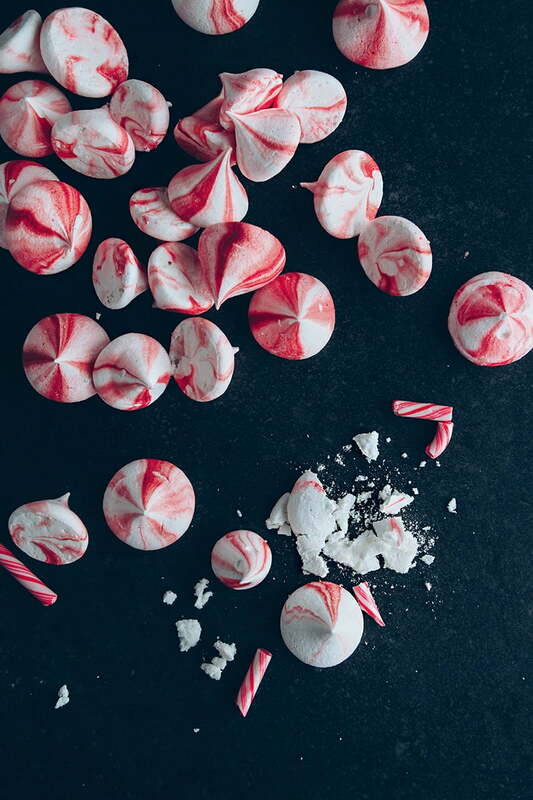 I ended up calling them peppermint meringue buttons. (They were much flatter, I probably didn't beat them enough, and I used red sugar sprinkled on the top.) I put them in a bowl on the dessert table. Within an hour they were gone and people were asking for more! They LOVED them! Nobody could believe they were made from chickpea juice! THANKS! So happy you enjoyed them, Melanie! Love the idea of using the red sugar on top. Sorry to hear they were a bit flat, quite a few things can cause that but as long as they tasted good - that's what counts ;-) Have a great Christmas! These are great!!! I need to work on my piping skills but they're still cute!! They are so pretty, I have actually been looking at them for ages! Beautiful work as well as they look so cheery! These are just beautiful and totally perfect Aimee! I want them all! 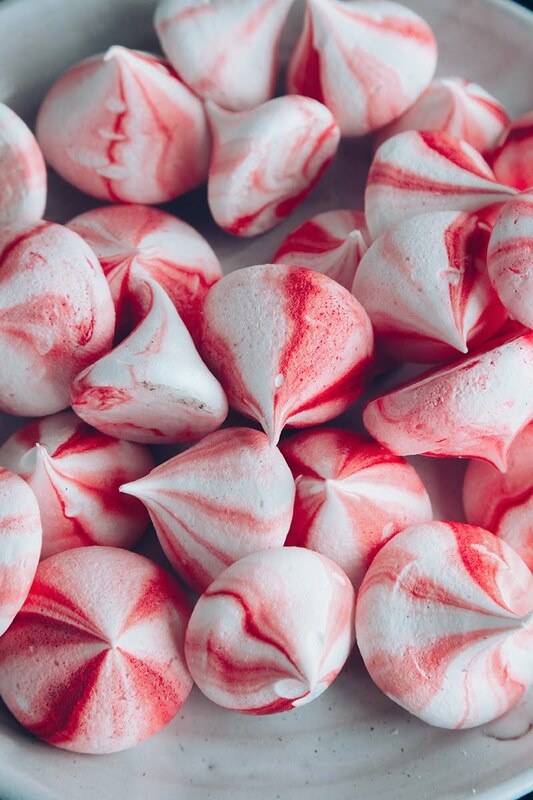 These are like straight-from-a-kitchen-supply-catalog-holiday-edition-make-me-jealous-because-I-don't-have-this-kind-of-meringue-piping-finesse amazing!!! Okay so I've never actually tried, but anytime I've attempted 2 colors in one piping bag it always ended up brown...that last time was when I was like 9 though so there's that :D They are absolute festive perfection, everyone should just stop posting other holiday desserts now because these are perfect for any and every Christmas occasion!